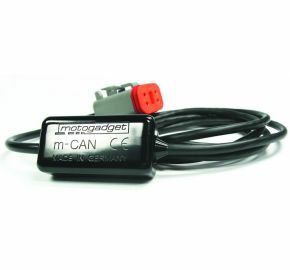 The m.CAN OBD is a digital adaptor for the hassle-free direct connection of our instruments to the diagnostic interface of post-2004* Harley-Davidson™ bikes. Plug & Drive - it doesn't get easier! With the m.CAN OBD digital adaptor simply plugged into the interface, your motogadget instruments can read data straight from the SAE J1850 bikes data bus: Speed, RPM and MIL (check engine warning light). Power is also supplied via the OBD interface. A motoscope mini for example, can be operated without any modification to the original wiring harness of the motorcycle. * The application is not possible with Harley-Davidson™ Softail model year 2011, Dyna model year 2012, XL model year 2014 and later. There is no possible connection with models that have the H-D-LAN system. Fits only models with SAE J1850 system.